Out of the Comfort Zone: A Case for Making: Kids Love to DO Stuff! My TAG pull-out groups frequently ask "when can we build something again." After sitting at desks, staring at books or computers most of the day, they crave hands-on learning and creating things. Some might ask what this has to do with reading and math since that is the areas the program serves with the pull-out groups, but what I witness with these activities is so much more valuable. They collaborate, create, solve problems and have fun doing it. 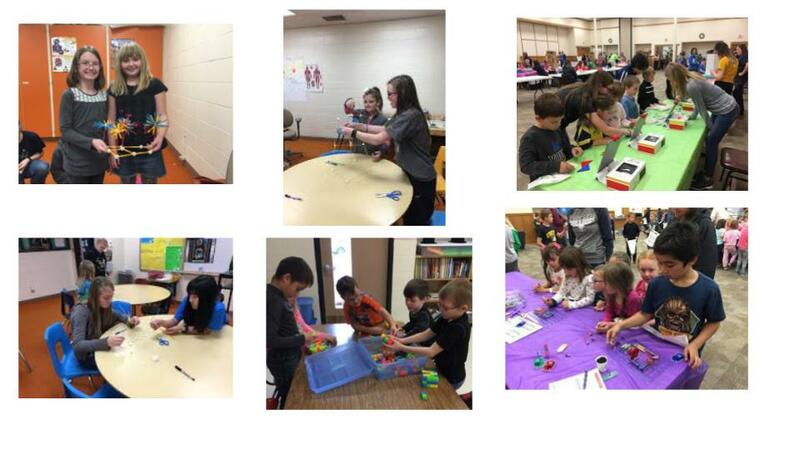 In the pictures below students have built a creation using Zome Tools, represented math problems with Omnifix Cubes, explored patterns with Osmo Tangrams, and learned about electricity with Snap Circuits. The Osmos and Snap Circuits were borrowed from our local area education agency but will be a possible investment after watching the students work to solve issues. The other two pictures show a project that took very little investment: a STEM challenge using spaghetti and marshmallows in a competition to build the tallest tower. It amazed me which students were able to get right to work with an idea, and which ones had no clue where to begin. One of our goals for the next two years is to create a "maker space" in our intermediate building, then in our primary building. The activity that will go along with these spaces will be messy and chaotic, but I can't wait to see what they create!